Is drinking outside one of the best activities in warmer weather? Absolutely. 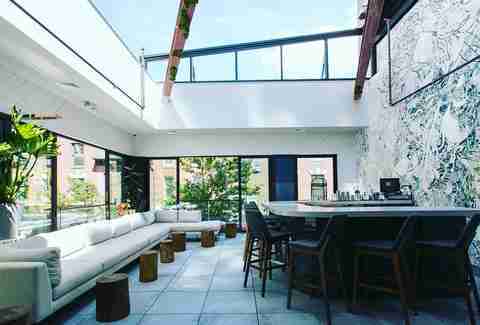 Why not upgrade that theory and add some eye-popping cityscape views to your outdoor eating and drinking? As the temperatures rise, it’s time to take in Philly from every angle, whether it’s over bustling Broad Street, elevated in South Philly, overlooking the Schuylkill River, or even between rounds of bowling. 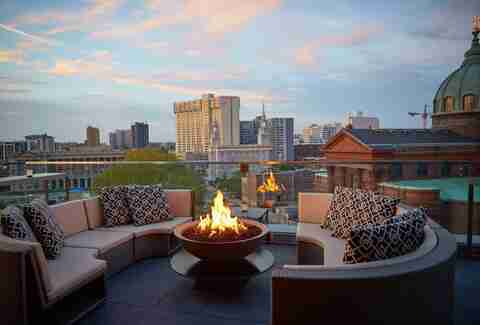 Take a look below at our favorite rooftops to wine and dine in Philly. 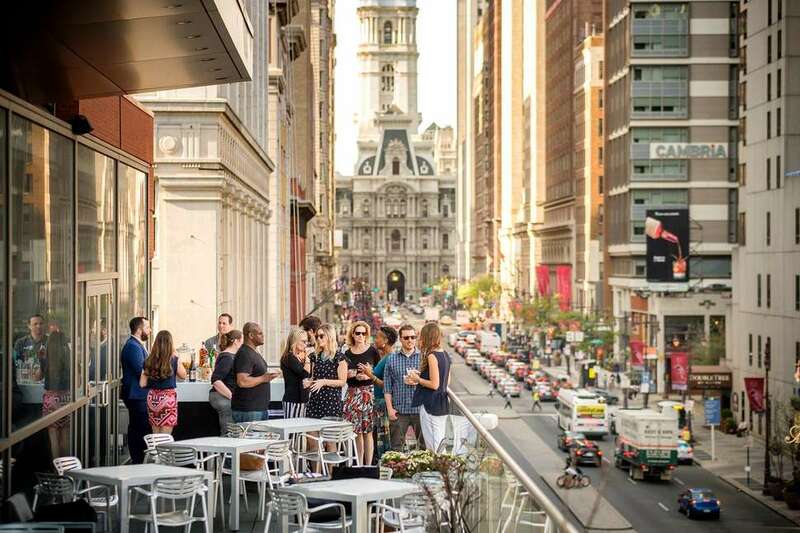 It’s hard to find a rooftop view in Philly more bustling than the one upstairs at the Kimmel Center, where Balcony Bar serves happy hour drinks every Wednesday, as well as some bites from the Garces Group, all summer long. Grab a seat and watch the chaos of Broad Street while comfortably removed from it. The indoor/outdoor rooftop bar at the new Cambria Hotel shows off views from the corner of Broad & Locust, especially toward South Philly and the east, all easily soakable from the lounge areas and outdoor tables. Small plates of seafood and other selections from the raw bar add to the lush ambiance, but if you’re hungry for something heavier you can simply go downstairs to the hotel’s new Del Frisco’s. This Izakaya’s second level patio is outfitted with tables and chairs imported from Japan, perfect for toasting with hard-to-find sake and other cocktails. The University City space offers a view of the Schuylkill River and the Philadelphia skyline from Chestnut Street. 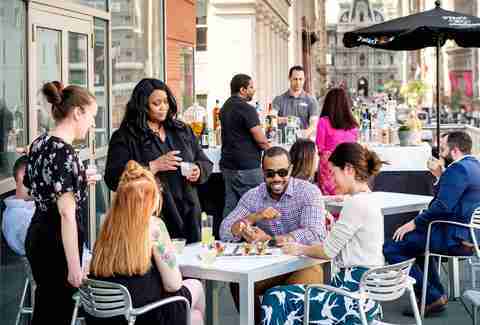 Bok Bar, the seasonal rooftop bar on the former vocational school now known as the mixed-use Bok Building, offers sparkling views of the city from South Philly, drawing crowds all summer. In the off season, you can still head to Bok’s 8th floor bar, Irwin’s, which stays open all year and features a rooftop terrace to offer yet more stunning views. At the bar expect local beers, ciders, and plenty of rose. 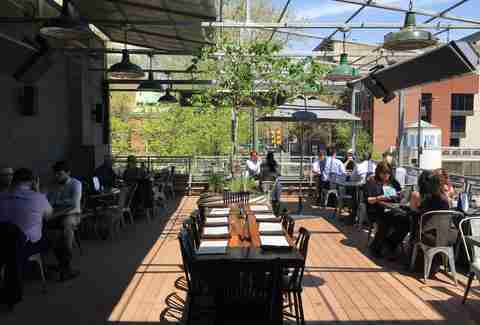 The Gayborhood restaurant is home to Philadelphia’s first and only retractable roof, meaning the space can easily morph from dining room to outdoor bar and back again. The stylish space emphasizes French-inspired snacks and high-end cocktails. 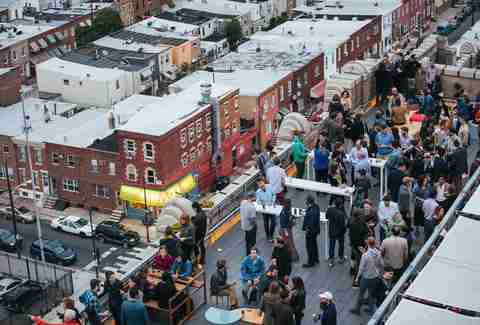 Now you can go bowling and drink on a rooftop terrace -- what a world. 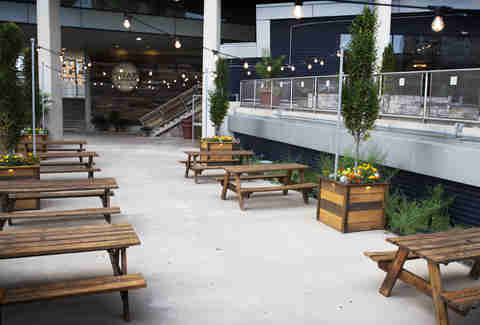 The hip South Philly bowling alley also sports a seasonal roof deck available for private parties and happy hours throughout the week. We bet your game will vastly improve after some $3 sangria. Located on the Ben Franklin Parkway, and overlooking the city from nine stories on top of the Logan Hotel, Assembly is the newest rooftop worth a visit. Stop by after work during the week when the bar opens at 5pm and snag one of the nap pods to hear the night’s DJ of choice, or head over a little earlier on the weekend (3pm) for an afternoon drink. The drink menu is heavy on the bubbly and wine, plus seasonal bites like oysters, baked brie, and tuna tartare. For late-night dancing and lounging under the stars, look no further than Stratus Lounge’s clubby vibe at the top of the Hotel Monaco. A safety barricade blocks any view the rooftop could offer (and man, the potential! ), but it's made up for by the stylized rooms -- like the darker pseudo-library lounge -- and ample space to mingle outside, or run for cover from unsavory weather at the indoor bar. 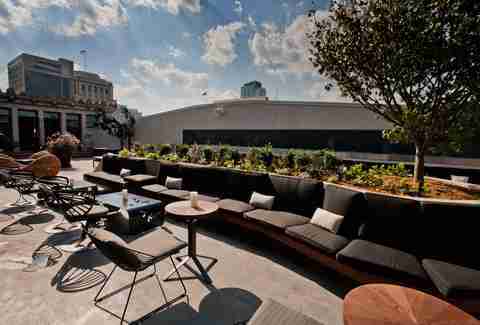 The rooftop space at this campus favorite is almost as expansive as the craft beer menu. During the summer, tons of outdoor events -- from clambakes to outdoor movies -- make great use of the area, but you can also just linger by one of the many fire pits to stay warm after the sun sets. 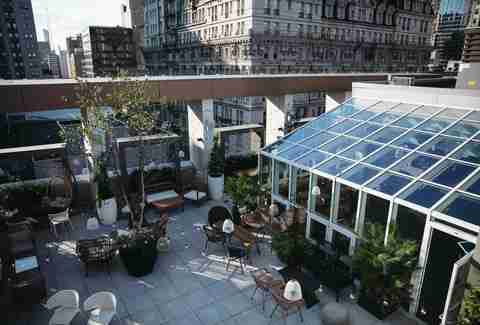 Rooftop drinks at the Continental can be as casual or as formal as you like, and the spot does particularly well for an easy, impressive romantic date night. Have a full-on dinner or just post-dinner drinks on the indoor/outdoor rooftop bar and lounge overlooking the busy corner of 18th & Chestnut Streets. If the giant olive outside the building didn’t tip you off, the drink of choice is the martini, but there’s also plenty of other retro-inspired specialty cocktails, too. This NoLibs mainstay is known for three things: rotating craft beer drafts, phenomenal pub fare, and a laid-back, all-seasons rooftop deck. 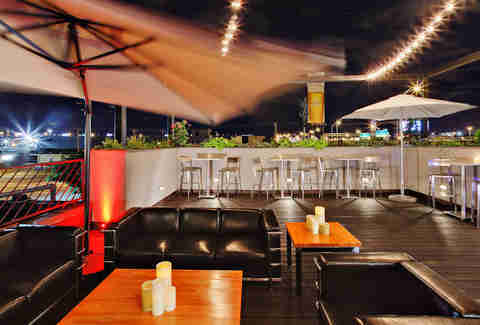 Canopied and overlooking Poplar St., the deck is a perfect place to settle in for pint after pint with friends. The deck at Revolution House overlooks the corner of Market & 2nd Streets, presenting a prime people-watching opportunity. 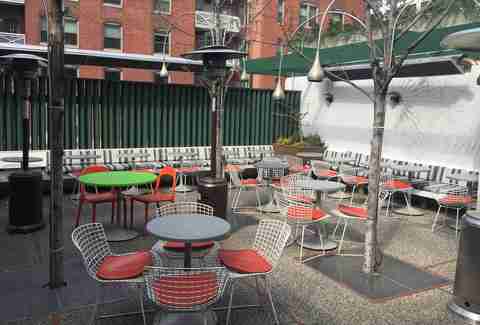 Soak up some sun while gorging yourself on the restaurant’s squid pizza and lobster pot pie. The airy Sopra Lounge at Positano transports guests to a breezy setting reminiscent of Italy's Amalfi Coast. 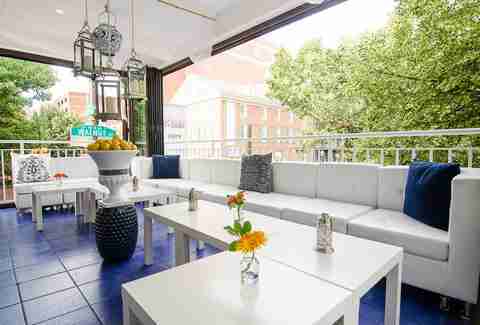 Chill on luxe white furniture surrounded by blue accents while trying the crudo and wine menus for a laid-back-meets-luxe rooftop experience in the heart of Philly. Serving South Pacific-inspired drinks in a fun, kitschy atmosphere, Tiki's nestled in the corner of 13 & Sansom in the midst of the Gayborhood/Midtown Village main thoroughfare. The tropical vibe continues outside on a cozy rooftop deck outfitted with twinkly lights and bamboo -- and delicious happy hour deals. Marielle Mondon is a writer from Philly who is not afraid of heights while holding a cocktail. Follow her on Twitter and Instagram @MarielleMondon.